The also noted: "Shigetada fought in the Genpei War, originally on the side of the Taira (Heike) clan before switching his allegiance to the Minamoto (Genji) clan who triumphed at the decisive Battle of Dan no Ura in 1185." The British Museum web site describes this print as: "Shirafuji Hikoshichiro lifting a struggling white horse onto his shoulders; Ashikaga Takauji about to enter Fukkaiji Temple in the background." Illustrated in Ukiyo-e dai musha-e ten - 浮世絵大武者絵展 - (The Samurai World in Ukiyo-e), edited by Yuriko Iwakiri, Machida City Museum of Graphic Arts, 2003, #42, p. 174. 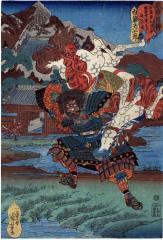 In Heroes of the Grand Pacification: Kuniyoshi's Taiheiki Eiyū Den it says "The print of Shirafuji Hikoshichirō lifting a horse onto his shoulders as he pursues Ashikaga Takauji alludes to the surprise attack on Hideyoshi by Shiōden Masataka..."